Stretching needs to be part of your training to be a succesful breakdancer. The frequency and duration will vary with your flexibility goals but an hour a week of stretching can produce good results. For example I stretch intensely 1-2 hours a week to maintain my current flexibility. How did I get my Splits? I used dynamic and isometric stretching to get my splits. It’s the fastest way to get flexible with strength in the new range of motion. Wait, you don’t know what that means? I didn’t either so here is a breakdown of the types of stretching. Isometric Stretching – Strong muscular contractions while stretching as you gain strength you also gain flexibility. An example is the suspended splits, a strong muscular contraction is needed to hold yourself. Passive or Relaxed Stretching – The muscle is relaxed while you stretch. My body is resting on the floor and my muscles are relaxed and not tensed as I work my splits. Static Active Stretching – Raising the leg then holding it unassisted. Typically only ballerinas and rhythmic gymnasts train for this type of flexibility. It is incredibly difficult to do. In the below picture notice how the leg is held up unassisted balancing a ball. Only elite athletes ever reach that level of flexibility. As a comparison you can see my static active range is about half of my dynamic and isometric flexibility and half of a rythmic gymnast. Dynamic Stretching – Raising the legs in a continuous motion then controlling them back. It’s a fancy way of saying kicking. 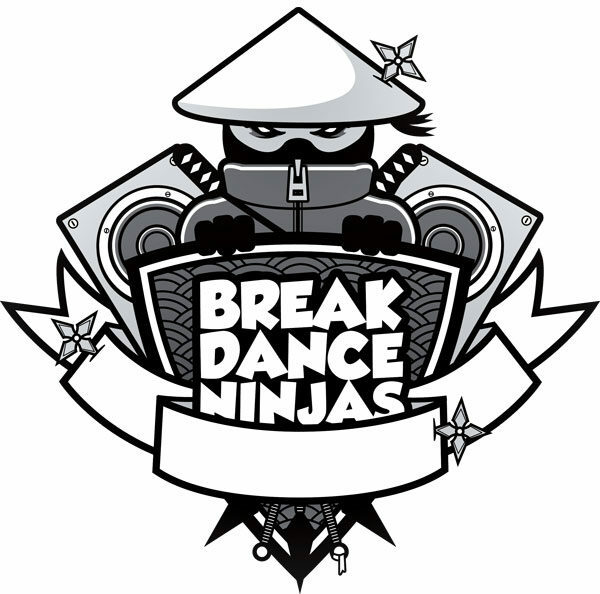 Dynamic flexibility is very important for breakdancers because it is most similar to how we move. Sports like ballet and martial arts also use a lot of dynamic flexibility. 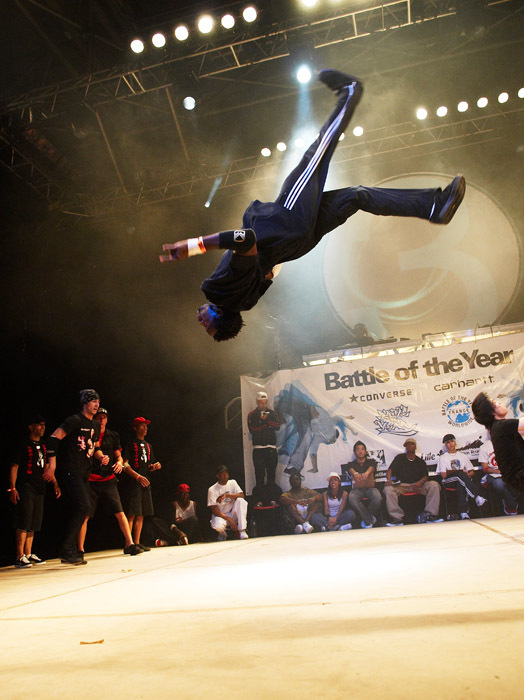 In the picture below the L-Kick pose is a common example of how breakdancers have to kick into a move in a controlled way. 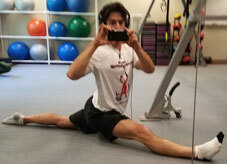 Now that I have my splits I stretch to maintain. So I do one to two 30 minute stretching sessions a week that use dynamic and isometric stretching. The videos below show my stretching sequence that I used to achieve and maintain my flexibility. But before you start here are some stretching rules. Dynamic Stretching can be done daily, the repetition amount is based on how many kicks it takes to hit your maximum range of motion than an additional 5 or so reps more. 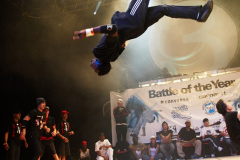 Dynamic Stretching can and should be done as a warm-up prior to breakdancing. Isometric stretching cannot be performed by kids approximately 11 or younger. The tense muscle contractions can damage tendons, ligaments and/or muscle. Isometric stretching cannot be performed if the target muscle is already sore. A sore muscle means it is already torn from previous activity and isometric stretching will tear the muscle more inhibiting flexibility. Isometric stretching is like a workout, so adequate recovery between isometric stretching sessions is required. Proper dynamic and isometric stretching should produce flexibility increases of approximately 1 inch (2.5 centimeters) per week when performed properly. If you feel pain during stretching STOP! Something is wrong, being uncomfortable is normal however. Your flexibility is only as good as your training. So get to it!